Brandworkz CEO Jens Lundgaard rolled out the Brandworkz Roadshow in March 2014 with four bookings to speak at marketing and digital asset management events, both virtual and physical. The month kicked off with a guest lecture to the students on the Digital Asset and Media Management MA course at King’s College London. The MA addresses the creation, management, curation and repurposing of digital media and digital assets in general so Jens’s guest lecture enlightened students about how this can be applied in the commercial sector. Jens gave an overview of the marketing technology landscape, highlighting the importance of digital asset management as the engine feeding imagery, logos and text to other marketing platforms. Having talked through some real client stories, Jens ran through his view of the top ten pitfalls in digital asset management implementation, highlighting the main problems for clients when a digital asset management system is not thought-through sufficiently before launch. Next up was a talk to 1,500 Chartered Institute of Marketing (CIM) members who signed up for a webinar organised by The Marketer, the magazine for the CIM. Taking the theme ‘Brand marketing: how do businesses keep customers happy in the digital age?’, Jens was one of three presenters looking at how the role of marketing is evolving and modern technology means brands need to be equipped for the digital world. They addressed questions such as how you tell a compelling story online, manage assets across a range of digital media, and streamline internal processes. Mid-month it was the turn of Cross Media Production at the Excel Centre to call on Jens’ presenting expertise. The event conference focused on how you look beyond campaign planning and get under the hood of building, managing and delivering your communications across multiple platforms, discovering which innovative solutions exist to tie your campaign together and how you can automate these processes reacting instantly to the demands of your target audience. 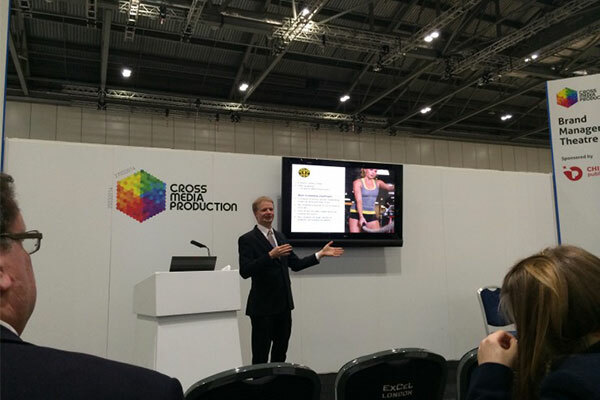 Speaking in the Brand Management Theatre, Jens explored ‘How to deliver stronger marketing and brands’ by telling the stories of our clients Icebreaker, Jones Lang LaSalle and Gold’s Gym and giving his five key brand implementation tips. A trip to the University of East Anglia in Norwich rounded off the month of March, with a speech to the post-graduate Msc students on the Brand Leadership course. The first of its kind and pioneered by Robert Jones of global branding agency Wolff Olins, graduates from the course go on to careers in branding and brand management in agencies and client side worldwide. You can view the prospectus here. Jens’ brief was to talk to the students about the role of technology in managing brands better. With much of their course taken up in learning how to develop brand strategies, the lecture was a fascinating insight for the post-grads into the implementation and ongoing management of brands. Jens explained that technology is a huge part of the role of a marketer or brand manager and illustrated where brand management technology fits in the brand/marketing chain. He took them through the typical ways in which a brand management platform would be used giving client examples as illustration. He rounded off with his thoughts on why useability and user experience are so important in getting people to use a system and by answering questions about the industry.